Most people living in an area with a cold winter depend on spring to return and with it so many enjoyable things that spring and warm weather bring. The return of multitudes of shore and wading birds that populate our shallow coastal areas is something I look forward to each year. I love to watch them and photography gives me a little bit more of a push to get out in nature. It also teaches me patience in waiting for ‘good action’. One could say I depend on this to make my life a little more complete. The birds of course depend upon a healthy environment and a plentiful supply of food to make their summer nesting season successful. So many dependencies and so many great things to photograph on the Delaware coast. 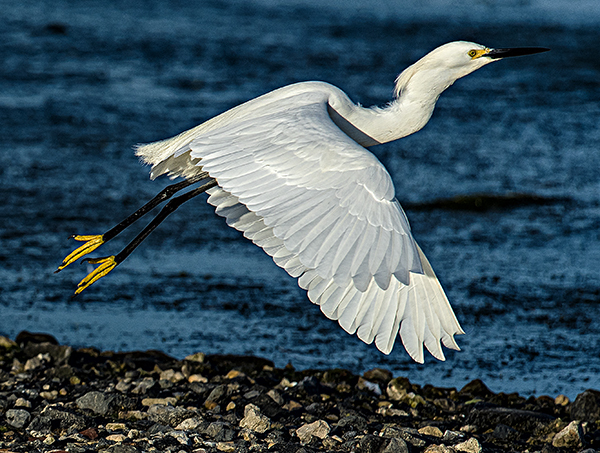 This Snowy Egret takes flight recently at Prime Hook National Wildlife Refuge. 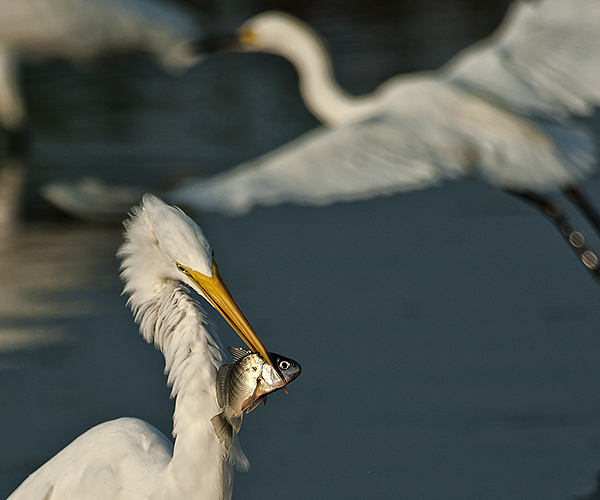 These two Great Egrets are seemingly instep as they hunt for breakfast. 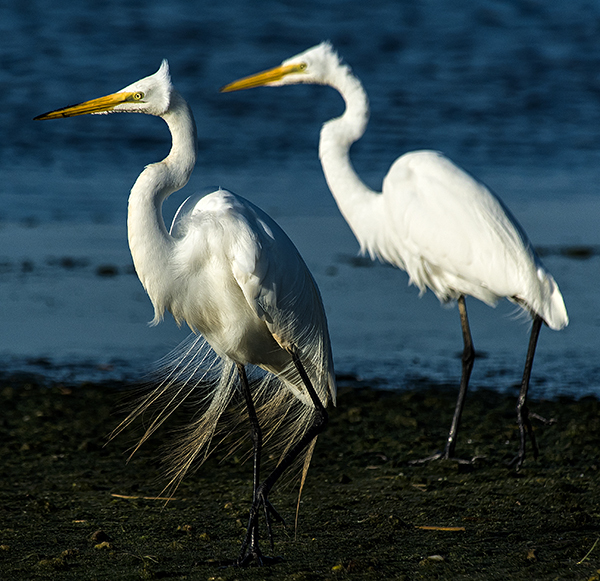 The tide had dropped and the strong breeze had exposed a tidal flat, stranding minnows on the dry surface which made for easy shopping for the egrets. 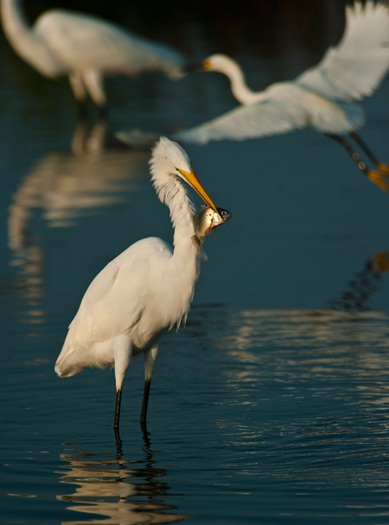 On April 14, 2014 I photographed this egret at Prime Hook National Wildlife Refuge. 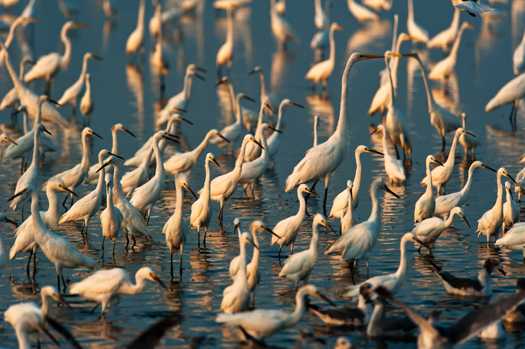 Over the next 30 days spring will take hold in Delaware and we will see many signs of the new season including the return of these wading birds in good numbers. Get ready to get out there and photograph the signs of the warming weather. Who’s ready for that? 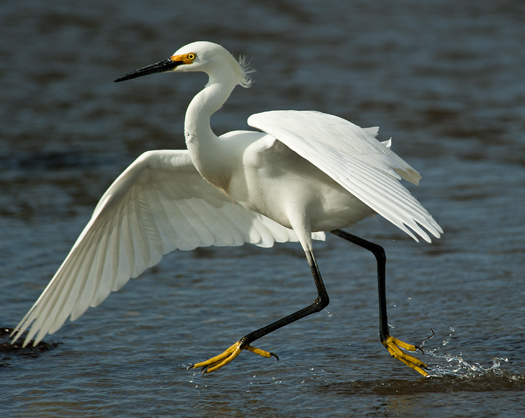 This Snowy Egret seems to be running on water this afternoon at Prime Hook National Wildlife Refuge. Temperatures here this morning were right around 0 degrees (f). It has been a couple of weeks now of good old fashioned cold January temps and it looks like we have a good stretch of cold weather ahead. I really do love the cold, snow and ice of winter especially for the nice variety of photography opportunities. But I also look forward to change in seasons especially from winter to summer. Tonight I indulge a yearning for warmer times and the egrets that put on great shows while feeding in the shallows of the coast. I look forward to these shows just a few months from now. Three sets of eyes tell the story of three sepaerate emotion, I imagine. 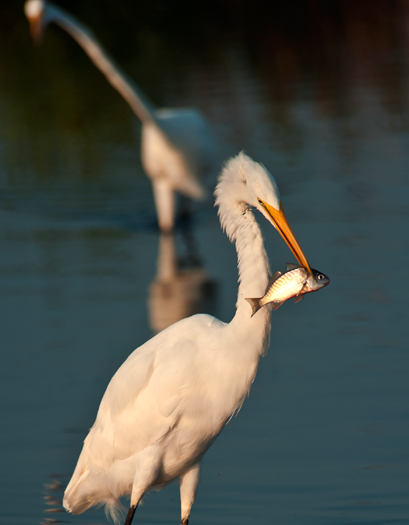 From back to front; there is apparent envy in the look of the egret in the background, the lucky fisher-bird in the foreground has an eye of satisfaction and, of course, the poor fish has a look that migh say, ‘so I get to see the world above water as my last vision! !’ This was a nice moment photographed last summer. 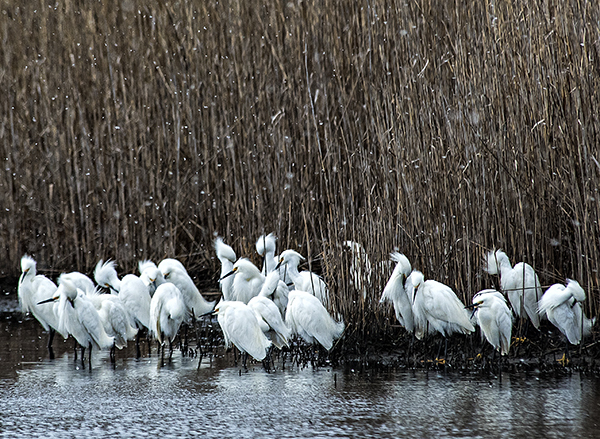 A coastal pond was very full of egrets on Saturday. 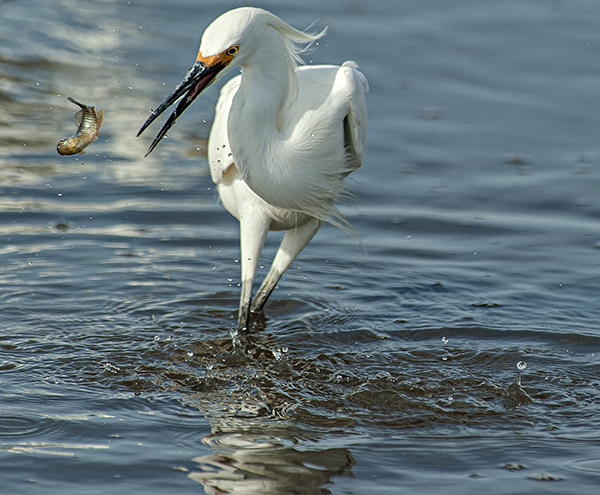 A fish gets a brief view of life above the water just before its trip to an egret stomach.